Kosovo Democratic Institute (KDI), held today a press conference about the functioning of the work of the Assembly of the Republic of Kosovo. 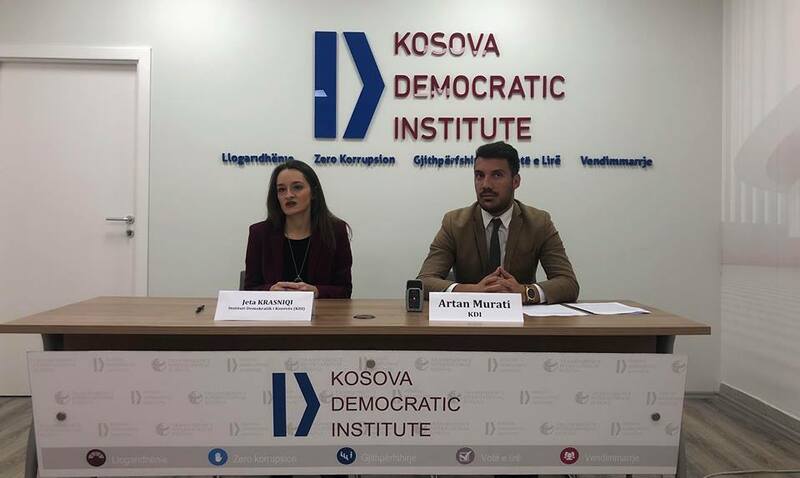 On this occasion, Artan Murati from KDI stated that more than a year since the constitution of the sixth legislature, the Assembly has failed to function properly and has constantly faced different crises, mainly of political nature. “With the beginning of the autumn session of the Assembly’s work, the work blockade in the Assembly has also intensified, paralyzing parliamentary life. Of all sessions held this session, only one has managed to end on the day it started. Although often the failure to work in the Assembly is being attributed to the opposition boycott of the work of the Assembly, however, the factors of the Assembly’s dysfunction are varied, “he said. The parliamentary majority’s absences are one of the main problems of this legislature, a trend which is continuing in the autumn session. KDI considers that Parliamentary Groups in the majority should be well co-ordinated to enable the conduct of plenary sessions. “If opposition parties are exercising their right to the boycott of the Assembly, the ruling coalition should be mobilized to provide sufficient numbers of plenary sessions and parliamentary committees,” he added. Murati emphasized that the KDI invites the Assembly Presidency to hold regular meetings and convene sessions at more frequent intervals, preventing the gathering of many agenda items as this is directly affecting the non-fulfillment of the legislative agenda. Regarding the role of the opposition, he underlined that so far, the opposition parliamentary groups did not have a common strategy either for boycotting the work of the Assembly or for new elections. “This uncoordinated approach has been unproductive and has failed to bring the expected results to the opposition. Although opposition entities are not obliged to make the numbers to the entities in power, however, constructiveness for the general good is necessary, “Murati added. He among other things said that consensus among political subjects is crucial in this period, and that debate should not be shifted to other forums outside the Kosovo Assembly. While Jeta Krasniqi from KDI spoke about the Kosovo-Serbia dialogue as one of the issues that is affecting the blockade of the work of the Assembly and the boycott of the works of the plenary sessions by the opposition. She has estimated that the beginning of the new phase of the Kosovo – Serbia dialogue has caused polarization among the political parties in Kosovo about expectations from this process, topics to be discussed and who should lead the dialogue process. “The lack of consensus on this issue has also influenced the work of the Assembly. The parliamentary majority has failed to secure the number of MPs to push forward its initiatives, while boycotting the session called by the opposition. The two-way boycott of the hearings resulted that none of the initiatives would be voted on. The session called by the opposition is still untreated, for which the opposition had declared that they would not attend regular sessions without the session being called by the opposition, “she said. Considering the importance of this topic, Krasniqi emphasized that the KDI considers that the debate about the Kosovo-Serbia dialogue should take place in the Assembly of the Republic of Kosovo where state platforms should be drafted on this process. The Assembly should be pro active in this process should define the red lines of dialogue as the highest decision-making institution, this institution should not be overlooked. Political parties need to reach political consensus on the process of dialogue before reaching an eventual agreement with Serbia to avoid scenarios of the past as that of the agreement with Montenegro which in the absence of political consensus damaged the state of Kosovo both in internal and external sphere. At the same time she said that the Assembly of the Republic of Kosovo should ask the Government of Kosovo what is happening in the process of technical dialogue, who is leading this process, considering that the chief negotiator appointed by the Prime Minister is waiting for the nomination for the ambassador to the United Arab Emirates (UAE). Krasniqi underlined that the Assembly should ask the Government of Kosovo to submit all documents regarding the agreements reached within the framework of the dialogue over the 7 years and to urgently request the report by the Prime Minister of Kosovo on the agreements reached so far, what are the agreements, how these agreements have been implemented, what effects have they brought, where are the process lags and what are the Government’s proposals regarding the status of these agreements?